This chapter is an almost verbatim repetition of an earlier chapter, Psalm 14. As discussed in our introduction to that chapter, it foresees the time of the <?xml:namespace prefix = st1 ns = "urn:schemas-microsoft-com:office:smarttags" />Temple's destruction, when the wicked emperor attracted a large following that assembled under the heretical slogan, "There is no God." They were unified in their defiance of the Almighty and arrogant reliance on their military power. David foresees their ultimate downfall and the full restoration of Jewish sovereignty in Zion, at which point "Yaakov will exult, Israel will rejoice." 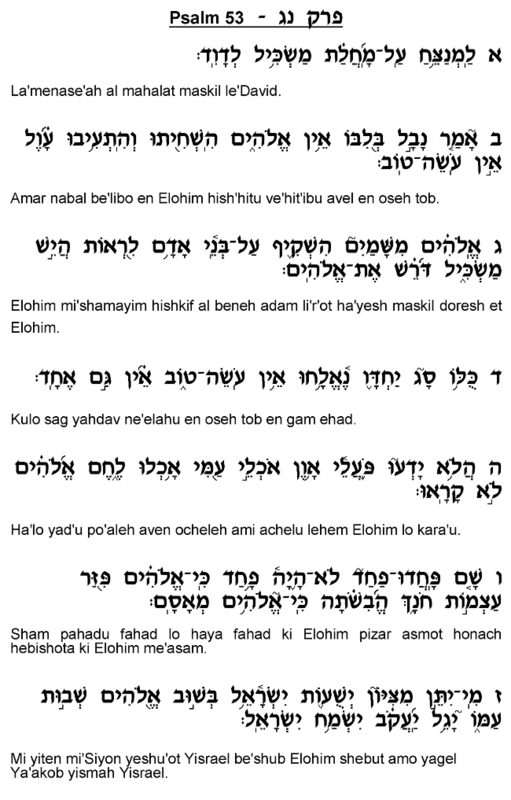 Why is this Psalm repeated? 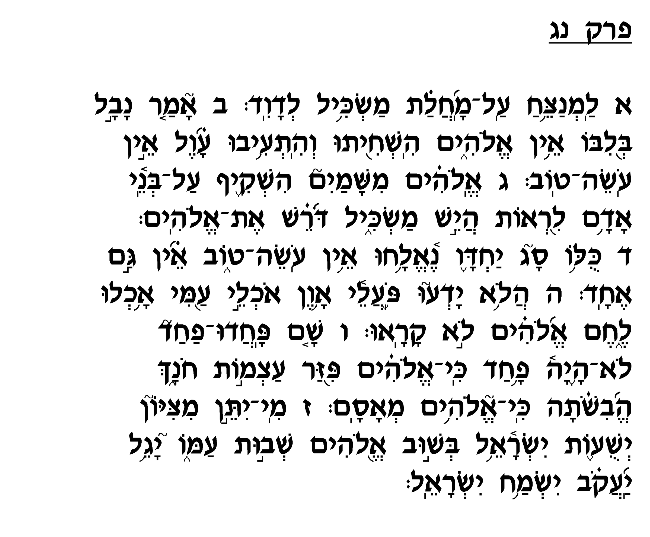 Radak explains that David repeated this Psalm in this context in order to draw an association between Israel's redemption and the personal salvation he experienced. The chapters that immediately precede and follow chapter 53 speak of David's struggles against his personal adversaries who sought to bar him from the kingship to which he was destined. By inserting this reference to the Temple's destruction in this context, David sought to compare his personal travails and Israel's suffering in exile. Just as he was pursued and persecuted but ultimately prevailed and ascended to the kingship, so will Am Yisrael emerge triumphant against its oppressors and return to it previous state of glory and prominence. Rashi and Mesudat David explain differently, claiming that this chapter and chapter 14 refer to the two Batei Mikdash: chapter 14 describes the destruction of the First Temple by the Babylonian emperor Nevuchadnetzar, while chapter 53 speaks of the fall of the Second Temple at the hands of the Roman general Titus. According to both approaches, it would seem, the repetition of this Psalm serves to demonstrate the consistent pattern that runs throughout the history of Am Yisrael, which has seen individuals and nations of all kinds rise against them. The motives behind the oppression may differ from one nation to the next, but all instances of persecution against Am Yisrael share one basic feature: they ultimately fail. The pattern that emerges from David's struggles against his adversaries and the rise and fall of the Babylonian and Roman empires is one of short-lived victory followed by defeat and obliteration. Ultimately, all who declare "There is no God" will be shown the power and authority of the Almighty, as will be clearly manifest by Am Yisrael's return to Zion and the restoration of its sovereignty and glory.